The Scooby-doo Horror Movie Parodies episode that was going to be titled “Scooby-doo Meets Chucky” has a new name! It is now “Scooby-doo Goes to the Valley of the Creepy Dolls”. The story became longer than I had originally intended and other creepy dolls were finding their way into it so, I treated it as a Halloween special. Enjoy! The next episode of the Scoody-doo Horror Movie Parodies is coming soon! Watch Scooby-Doo meets Pinhead, The Exorcist’s Regan MacNeil, The Shining Twins, Pennywise, and Jason Voorhees NOW! Episode 5 in the Scooby-Doo horror movie parodies! Scooby and the gang decide to go camping on Halloween to get away from all the ghouls, specters and creeps. I guess that means hockey mask wearing murderers are fair game. If you don’t want your image of Mystery Inc. tarnished, then listen to Scooby-Doo and “Scooby-Don’t” watch! Starring Funko Pop! 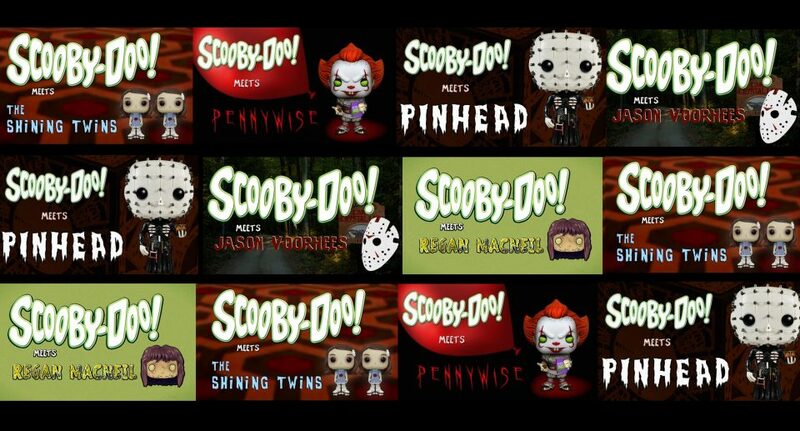 vinyl figures as Fred, Daphne, Velma, Shaggy, Scooby and Jason Voorhees! It takes less than ten minutes to watch the first 8 episodes of A Stranger’s Thing on YouTube.com! Synopsis: A Stranger’s Thing is an animated parody of the Netflix series Stranger Things and stars Funko Pop! vinyl figures. Joyce is a single mother who has discovered that her young son Will is missing. Around the same time, a strange thing begins lurking around her home and in the town she dwells. Joyce spends more time trying to get to know the strange thing than she does searching for her own son. Winona Ryder, who plays Joyce in the Netflix series, is the prime focus of this parody – mingling with characters from past films in which she has starred. Soon, a growing number of leading males are after Joyce’s heart, but she has fallen for just one – the strange thing. Alice’s Grave Misadventures – Free Kindle Books! Sunday, July 2nd – all three parts to “Off With Their Heads!” Alice’s Grave Misadventures will be FREE for kindle! Click HERE to view them on amazon.com! A Stranger’s Thing – Episode 5: Corn Nuts There are three things missing from this episode of A Stranger’s Thing – and they are all named Heather. Joyce’s reality continues to be changed by the fictional lives of characters played by a certain Hollywood actress. Reality and fiction are spilling over onto each other and creating a strange time for Joyce who doesn’t seem to notice a thing.